It is a duty previous attorneys general have embraced. The department’s rank and file still extols a story from more than a decade ago. In that encounter, the ailing attorney general, John Ashcroft, allowed his acting replacement, James B. Comey, to defy the Bush administration during a confrontation in his hospital room over a surveillance program that Justice Department lawyers had deemed unconstitutional. The traditional lines have blurred under Mr. Trump and Mr. Sessions, however. For nearly a year, the president has critiqued the work of the Justice Department and complained about Mr. Sessions for perceived infractions and acts of disloyalty. 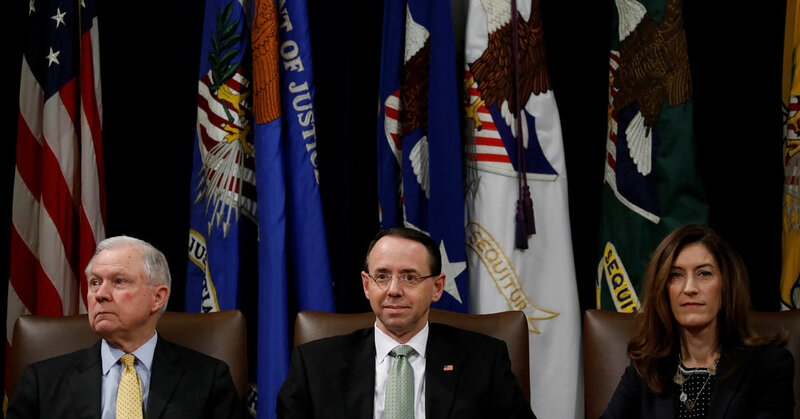 He attempted to fire Robert S. Mueller III, the special counsel overseeing the investigation into Russian election interference and possible ties to the Trump campaign, and considered firing Rod J. Rosenstein, the deputy attorney general who oversees Mr. Mueller. While the Justice Department has argued that a case brought by Paul J. Manafort, a former campaign chairman for Mr. Trump, against Mr. Mueller should be dismissed, Mr. Sessions has not voiced robust support for the special prosecutor. Through a spokeswoman, Mr. Sessions declined to comment for this article. Mr. Sessions’s standing with Mr. Trump has eroded in his year as attorney general. The president criticized his Senate confirmation performance and his decision to remove himself from overseeing the Russia investigation, even musing that he would not have hired Mr. Sessions had he anticipated the recusal. He berated him so severely over Mr. Mueller’s appointment that Mr. Sessions offered his resignation. That fraught relationship has impaired Mr. Sessions’s ability to act as a bulwark between his lawyers and politics, former career prosecutors said. Mr. Pelletier said that although the attorneys general with whom he worked, from Edwin Meese III to Eric H. Holder Jr., clashed with their staff, they gave prosecutors and the institution itself unwavering public support. “Prosecutors and agents are extremely vulnerable if they’re not properly supported by leadership, especially when it comes to investigations and attacks launched on the political side,” said Daniel Petalas, a former prosecutor in the department’s public integrity section and the United States attorney’s office in Washington. Two current federal prosecutors who spoke on the condition of anonymity said they were working hard to maintain morale. They were heartened by reports of Mr. Wray standing up to Mr. Trump, and they remain optimistic that the institution can withstand political attacks, with or without Mr. Sessions’s public support. The silence from Mr. Sessions could have a more pernicious effect on the staff than the blow to morale, the officials say. The condemnations send the message that people can be persecuted for holding political beliefs at odds with those of the president. During a speech in Norfolk, Va., last month, Mr. Sessions said that he loved the department and that the “vast majority” of employees were patriotic and hard-working. But he also implied that it might be necessary to weed out “political bias and favoritism” from investigations and prosecutions. November 9, 2018 Comments Off on Now, the Markets Can Worry About Other Things. Here’s a List.